The British Books Challenge is a simple one. Read one book each month throughout 2018 that has a British author. You can my other #BritishBooksChallenge18 posts here. I was eager to see who the Author of the Month would be for February. Determined to read outside of my usual go-to authors I was keen to pick up something new. Robin Stevens is not an author I had heard of before. She has a new book coming out this month (‘Spoonful of Murder’), but seeing as it is the latest in a series I decided to go back and read the debut. I tweeted my excitement about this and then ended up in a conversation with Robin Stevens herself! But then Hazel discovers the Science Mistress, Miss Bell, lying dead in the Gym. She thinks it must all have been a terrible accident – but when she and Daisy return five minutes later, the body has disappeared. Now the girls know a murder must have taken place . . . and there’s more than one person at Deepdean with a motive. Now Hazel and Daisy not only have a murder to solve: they have to prove a murder happened in the first place. Determined to get to the bottom of the crime before the killer strikes again (and before the police can get there first, naturally), Hazel and Daisy must hunt for evidence, spy on their suspects and use all the cunning, scheming and intuition they can muster. But will they succeed? And can their friendship stand the test? 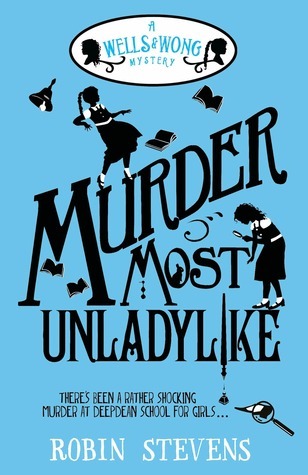 ‘Murder Most Unladylike’ is a quick and simple read. At least to me as an adult. I can think of several students who I would have recommended this to while I was teaching. The language is straight forward and accessible thanks to the first person narrative. The story is paced nicely and I like how it is broken up into parts. This is particularly useful for children that don’t have great attention spans. Rather than getting lost in long chapters or elongated scenes, the story is fast paced and engaging. Perfect! To begin with I wasn’t really sure if a murder had taken place. I thought perhaps the girls were just reading into things incorrectly but then there was another one! Oh and, I did not guess the murderer at all. That reveal came as a complete surprise to me. There was a moment where I was worried it was going to go down the dreaded teacher-student affair route (it didn’t thankfully!). Small note for Kindle readers – there are times where images of a notebook are included and they appear small and hard to read. A smidge annoying but doesn’t take away from overall enjoyment of the story. This review is also featured on Goodreads. Really enjoyed the story. Related to the characters/issues. Would strongly recommend. Want to see what I highlighted while I was reading? Click here.